Thursday, March 18, 2010 is this year's annual Ag Day at the Capitol. 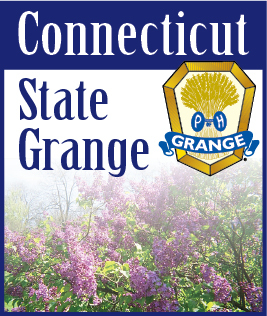 Located in the North Lobby of the Capitol from 10:00 AM - 2:00 PM, over 30 agricultural associations, including the Connecticut State Grange, will be present to answer questions and distribute information. Legislative leaders and their aides visit the displays, providing agricultural organizations the opportunity to inform policy makers of the importance of agriculture, to voice concerns, and discuss legislation important to agriculture. Over 250 Legislator bags with agricultural products and information will again be distributed to each legislator. At noon, presentations will begin and the official proclamation of "Connecticut Agriculture Day" shall be read. The recipient of the Outstanding Young Farmer (OYF) award will be presented. Sponsored by the Connecticut Agricultural Information Council (CAIC) and the CT Jaycees, the purpose of the award is to foster better urban-rural relations with farmers by creating a greater public interest and understanding of today's farmer and their challenges. Four national winners from the 50 states are honored annually at the National Outstanding Young Farmers Awards Banquet. Prior to the awards ceremony all attendees are urged to visit the variety of agricultural booths, enjoy the samples, and see what Connecticut agriculture has to offer. It's both a fun and informative day for all who attend. Organizations are encouraged to put together a dynamic and interactive booth, explaining the organization's mission and significance to Connecticut agriculture. Booths are manned at all times, and hand-outs and samples are greatly encouraged! For more information regarding the event, please contact Jaime Lizee Smith at 860-713-2559 or jaime.smith@ct.gov.